Children Safeguard – mBot v1.1 comes with a casing specially designed for protecting main control board. Meanwhile, the casing is atomized to safeguard children’s eyes from the glare of the onboard LED. Better Auxiliary Wheel – The ball omni-directional wheel of previous version is replaced by a mini nylon caster wheel that performs better when moving to any direction and dramatically reduces the little clack sound caused by a steel ball. Contracted But Not Simple – Contains 38 assembly parts that can be assembled in 10 minutes and color-labeled RJ25 ports for convenient wiring, making sure more time can be spent on programming and creativity. Graphical Programming – Drag-and-drop graphical programming software mBlock developed based on Scratch 2.0 provides a quick way to learn programming, control the robot, and realize multiple functions from the robot. 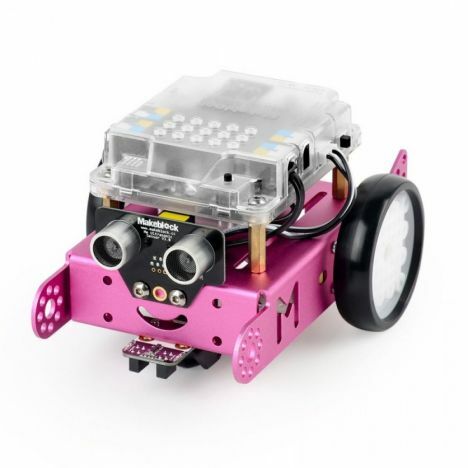 Makeblock mBot is an all-in-one solution to enjoy the hands-on experience of programming, electronics, and robotics. Working with mBlock inspired by Scratch 2.0, connecting with computers or smart devices via Bluetooth or 2.4G (by different version), this easy-to-assemble mBot provides infinite possibilities for you to learn STEM (Science, Technology, Engineering, Mathematics).